2d. In 1813 Mrs Francis Alexander purchased Milly & her children from Miss E. Brown (see Mrs Swann's deposition). Miss E. Brown came to live in Alexandria County between 1808 & 1810, but did not bring Milly untill about 1813. She likewise lived in Georgetown D.C. & Baltimore (see said deposition). 3d Will of Mrs F. Alexander giving Rachael to her son Lee Masi Alexander, to this will is attached a schedule of slaves to be free at 31, signed by the Admr. R. B. Alexander among whom is Rachael the Petr. Will proved in 1823. 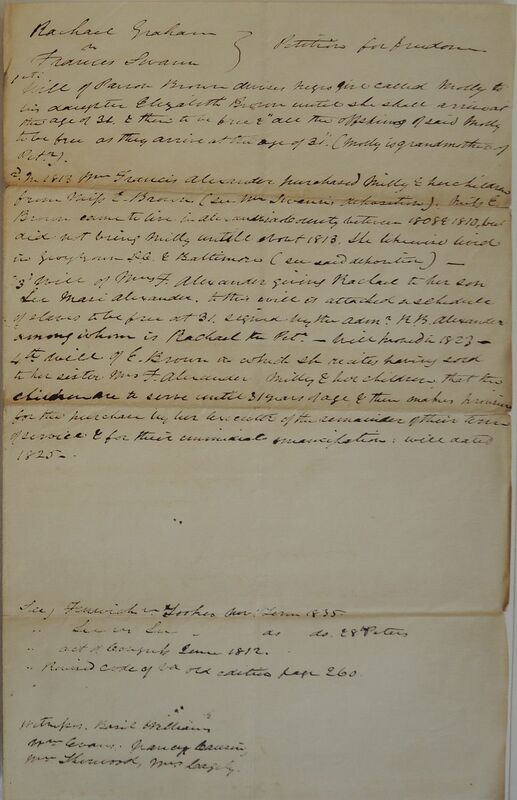 4th Will of E. Brown in which she recites having sold to her sister Mrs F. Alexander Milly & her children that her children are to serve until 31 years of age & then makes provision for the purchase by her Executor of the remainder of their term of service & for their immediate emancipation: will dated 1825.
" Act of Congress June 1812.
" Revised Code of Va old edited page 260.